If you are unfamiliar with how things turned out for the signers of the Declaration, it makes for great reading (click here, here, or here to learn more). Highest ambition? We’ve come a long way, baby. “Their private friendships and dearest connections.” Why? Because of what Washington said above: the health of America impacts the world and your family relationships and friendships aren’t as important as the potential misery of the world that results when too few speak the truth. No longer could we reflect, with generous pride, on the heroic actions of our American forefathers … if we, but for a moment entertain the thought of giving up our liberty. Many Founding Fathers lost their fortunes. Today, the subject of money and politics is a familiar one. People decry that we live in an era of multimillion-dollar campaigns. It would appear, however, that the flow of cash hasn’t exactly gotten the job done yet when it comes to preserving and protecting the principles laid out in the Declaration of Independence and the U.S. Constitution. In fact, just the opposite has occurred as the political left raises and spends a lot more effectively than the political right. On the national level there are people like the libertarian Koch brothers and radical leftist George Soros. More big wallets are opening wider as the clash intensifies between those who want a return to limited, Constitutional government and those who would prefer to “fundamentally transform” the United States. Examples of effective spending on the part of wealthy liberals are in the news constantly. One example: Due to many years of effective propaganda from the left and relative silence from the right, more Americans than ever are confused about the nature of homosexuality, the purpose of marriage, and the fact that the libertarians and liberals would like to repeal the First Amendment’s protection of religious liberty. Forget all the talk of federalism and that marriage is a state issue. Low information voters and far too many “high” information voters don’t realize that the homosexual “marriage” issue is all about religious liberty. The political left’s funding is infamous and their success is obvious. On the right, not so much. I’d argue that too few of the individuals with the means have contributed to the right causes. Expensive TV commercials, direct mail, “robo-calls,” and yet another fancy white paper detailing another left-wing policy failure have thus far failed to adequately inform the American public. The “drive-by” nature of election season campaigns leaves little lasting effect, and all the great commentary and research in the world makes little difference if it’s only seen by people who already agree. More enlightened donors must awaken to the fact that what is needed is communication infrastructure — not just more hit-and-run messaging. What do I mean by communication infrastructure? Permanent vehicles for the regular delivery of the information most citizens have been denied. For example, only after our state and local governments create an enormous mess does the Old Media bother to report on wrong policy and mismanagement. And even then rarely do voters learn the real solution to the problem. The Founders pledged, “our Lives, our Fortunes and our sacred Honor.” I’ll say this: plenty of individuals toil in the political trenches for little or no pay and most of them don’t have a fortune to fall back on. There are many who are not in the trenches that could act as a modern day Haym Salomon or a Robert Morris. Both men played a crucial role in the funding of the Revolutionary War. In August of 1781, our Southern forces had trapped Lieutenant General Charles Cornwallis in the little Virginia coastal town of Yorktown. George Washington and the main army and the Count de Rochambeau with his French army decided to march from the Hudson Highlands to Yorktown and deliver the final blow. But Washington’s war chest was completely empty, as was that of Congress. Washington determined that he needed at least $20,000 to finance the campaign. When Morris told him there were no funds and no credit available, Washington gave him a simple but eloquent order: “Send for Haym Salomon,” [who] again came through, and the $20,000 was raised. Washington conducted the Yorktown campaign, which proved to be the final battle of the Revolution, thanks to Haym Salomon. “Send for Haym Salomon.” Even the Father of his country needed funding — and he knew where to turn. It’s a travesty that too few Americans know the name of Haym Salomon. 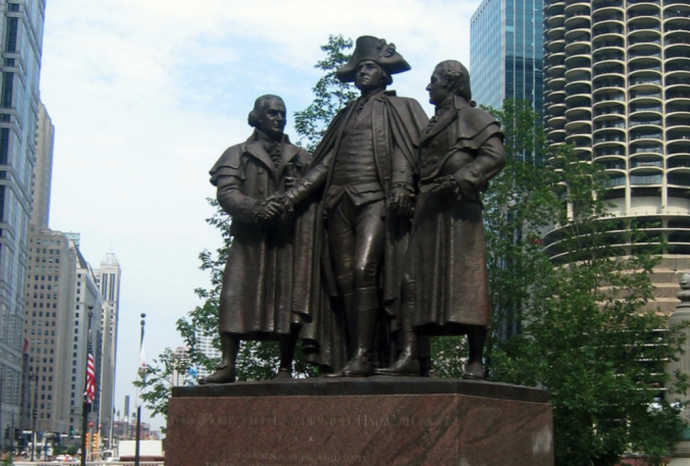 Chicagoans can see a statue in his honor on Wacker Street near the river. That’s the picture above. Click here to learn more about it. This is an invitation to those who can write checks to fund a much needed communications revolution from sea to shining sea. As I have been detailing all week, wealthy donors need to start exercising a little critical thinking. They need to stop supporting organizations that don’t have a vision to reach those yet unreached. We’ve already got the best informed choir in American history — and we all know that’s not good enough.